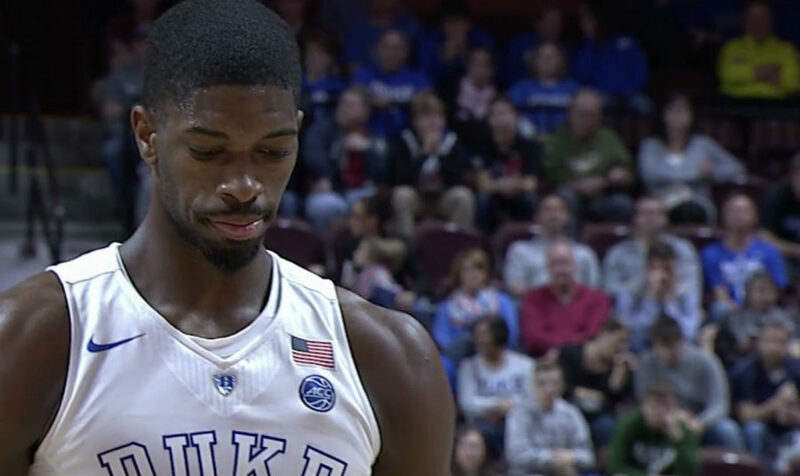 UNCASVILLE, Conn., Sporting Alert — Amile Jefferson had a double-double and all five Duke starters scored in double-figure and the No. 1 Blue Devils topped No. 21 Rhode Island 75-65 Sunday in the Hall of Fame Tip-Off tournament championship game. Jefferson followed his double-double on Saturday with a 17 point and 15 rebound performance a day late for Duke. The fifth-year senior shot 8 of 13 from the floor and grabbed 11 defensive rebounds. Luke Kennard added a season-high 24 points on 8 of 11 shooting overall and made four of his five 3-pointers. The sophomore forward also pulled down six boards. Matt Jones scored 13 points, freshman Frank Jackson ended with 11 and Grayson Allen, who became the 65th player in Duke history to score 1,000-points, finished with 10 points in the win. Allen, who has been bothered by a toe injury, shot just 3 for 11 overall and went 0 of 5 from long-range. The Blue Devils (4-1) who bounced back nicely from the defeat against No. 7 Kansas on Tuesday night with back-to-back wins in the Hall of Fame Tip-Off tournament this weekend, shot 45.8 percent as a team from the floor. Jared Terrell scored 22 points to lead Rhode Island and Hassan Martin added 15 points, six rebounds and five blocks in the defeat for the Rams (4-1) who were losing for the first time this season. Star guard E.C. Matthews was held to just nine points after averaging 19.5 points per game this term. The Blue Devils were without star freshmen Harry Giles, Jayson Tatum and Marques Bolden and junior Sean Obi, and Allen played at about 50 percent of his ability, according to Duke’s head coach Mike Mike Krzyzewski. Duke now heads home for games against William & Mary on Wednesday and Appalachian State on Saturday. The Blue Devils will also face No. 13 Michigan State in an ACC/Big Ten Challenge matchup on Nov. 29. Rhode Island, meanwhile will be off until it host Belmont on Friday.